A long long time ago, in a land far far away, there was a brave boy named Link. He had a magic sword that would slay all things evil. However, on days that Link wasn't fighting off the wicked, he would go to his favorite eating place and gorge on deliciously golden and crunchy Zelda Zucchini Puffs! Okay I am not a great story teller, but I don't have to be because these Zucchini Puffs speak for themselves. Nothing is more delicious than fried stuff dipped in ranch dressing! These snacks are so easy to make and so delectable. Now lets get cookin and best of all EAT! -Ranch dressing for delicious dipping! In a large bowl, combine zucchini, eggs, onion, and garlic. Blend in baking mix, salt and pepper. 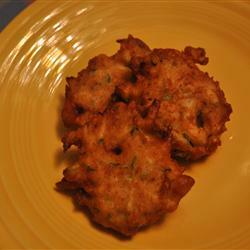 Drop batter by spoonfuls into hot oil, and fry until evenly brown and fluffy. Place puffs on paper towels to soak up excess oils. Sprinkle with salt before serving. Star Wars inspired "Leia Cinnamon Buns"